Last Monday marked Coming of Age Day across Japan. Traditionally an important day in the life of youths and their families, the holiday revolves around coming of age ceremonies (成人式 seijin-shiki) at which the country’s 20-year-olds are welcomed into adult life. Along with their legal responsibilities, on this day, new adults in Japan celebrate their rights to (legally) purchase and smoke cigarettes, drink alcohol, and vote. With a celebration so important that it deserves its own national holiday, it’s worth looking back into the past to try to track the origins of this ceremony. Although the actual age itself varies across civilizations, and indeed throughout time, the concept of an age of majority exists around the world. It marks a deadline by which a young person is expected to be a fully responsible adult, and as such, is granted the associated rights and responsibilities of adulthood. Across cultures, the age of majority has historically served as a guide to encourage the timely development of children. The celebration of adulthood is anchored in the local historical and cultural realities and passed on through oral history or written down in law. The first written records of a coming of age ceremony can be traced back to the late Asuka period (538-710). Back then, boys who had become adults were celebrated during a ceremony called genpukku (元服). At the time, Japan ran on a lunar calendar and the first full moon of the year landed on or around the 15th of January. It was considered a particularly festive time of year and this first full moon was traditionally called koshogatsu, or Small New Year’s. On this day, boys who had reached a height of about 136 centimeters (about the ages of 10-16) were taken to the shrines of their patron kami (spirits) to celebrate the onset of adulthood. 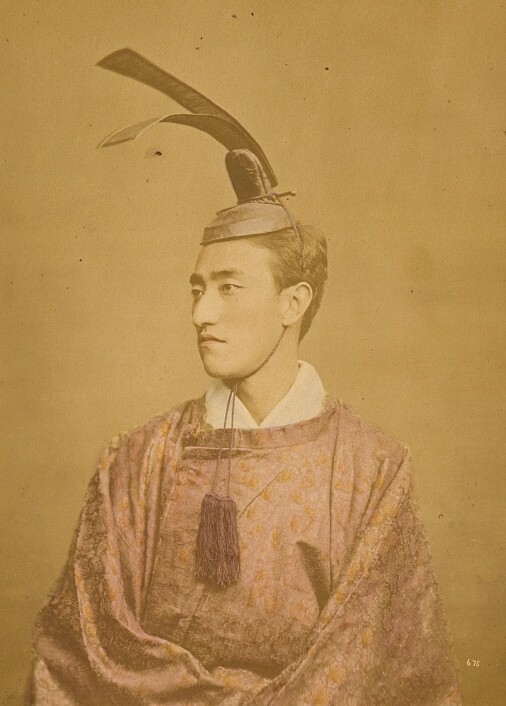 Young man wearing a kammuri hat, reserved for the nobility. 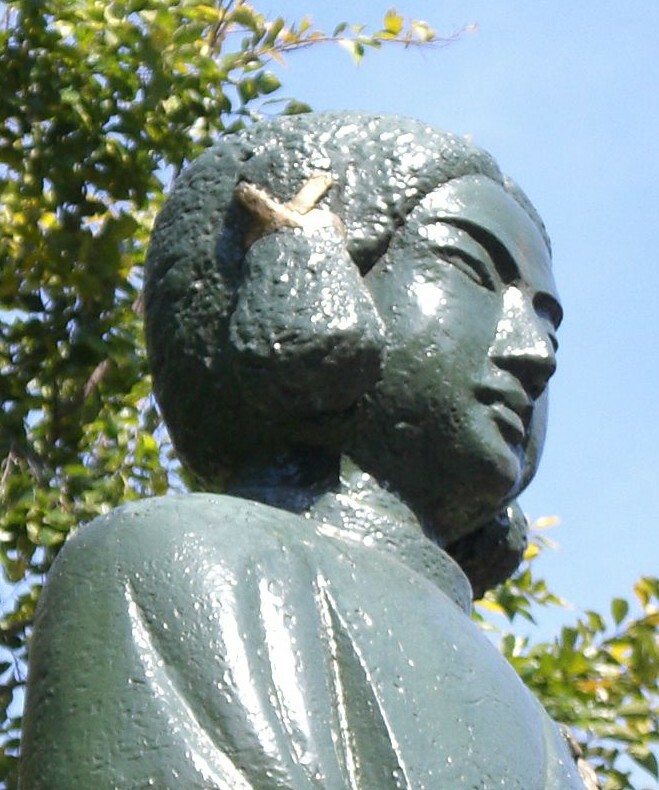 Statue of Prince Shotuko, bearing the mizuka (角髪) adult hair style. During the ceremony, the boys would be gifted with adult clothes and have their hair cut in an adult style, thus marking their entrance into adulthood. This is why the kanji for genpukku are gen (元), in this case meaning “head” and fuku (服) meaning “wearing.” In addition, the boys would be bestowed with a new adult name during the ceremony. For the boys born into the court nobility, the coming of age ceremony was called the kanrei (冠礼) or Cap Ceremony in reference to the adult cap, or kammuri, that the boys would begin wearing. Girls undertook a similar coming of age ceremony that revolved around receiving adult clothing. This ceremony was called moji (裳着) and took place around the age of 13. Life expectancy at the time is estimated to have been between 28 and 33 years. As part of the ritual, young women would have their teeth dyed black and their eyebrows shaved off before putting on a thick layer of makeup and painting on eyebrows. It is worth noting that no specific age was set forth for adulthood at this point in history, with some men stepping into adulthood as late as 25. Towards the end of the Asuka period, in 703, the government enacted a wide-ranging set of administrative changes, known as the Taihō Code (大宝律令 Taihō-ritsuryō). Thanks to increased exchanges with China, this new set of rules was in large part adapted from the rules and structures of the Chinese Tang Dynasty. Among other things, the Taihō Code saw Confucianism become a key guiding element of Japanese ethics and government. More importantly for the history of Coming of Age Day, the code specified the age of taxation and military service to be 21 (20 in the western and modern Japanese systems). Although nothing was outlined in the code regarding a specific age for coming of age ceremonies, the Taihō Code was the first to set forth an age for civil responsibilities that are normally associated with adults. It thereby was the first to define an age of majority in Japan. Throughout the subsequent Nara period (710-794), many revisions were made to the code to incorporate more aspects of Japanese traditions and to adapt to administrative needs as they arose. During Japan’s Heian period (794-1185), the coming of age ceremony was reserved for the sons of higher castes such as nobles and samurai. However, as time went on, the ceremony spread to lower ranking citizens. Following the genpukku ceremony, the boys, now men, were expected to perform adult work. For those of the samurai-class, new adults were considered full warriors and expected to wage battle as needed. It was also after the genpukku ceremony that youths gained the legal right to get married and to perform services at shinto ceremonies. From the Edo Period (1603–1868) onward, the ceremony for women dropped the name of moji and also came to be known as genpukku. By now, girls acceded to adulthood when they were aged 18–20, and in some cases at the same time as they got married. Because of male prostitution and male-to-male nanshoku relationships (more on this topic in a future article), it was feared that boys were being prevented from entering adulthood in order to maintain their availability. As such, a law passed in 1685 stipulated that all boys must go through the genpukku coming of age ceremony by the age of 25. This was a significant change. Close to 400 years ago, the age of majority in Japan was officially understood to fall between the ages of 18 and 25. It wasn’t until the emergence of the Meiji government that the legal age of adulthood for both sexes was set to 20 in 1876. During World War II, the last five months of the war saw 66 major Japanese cities targeted for area attacks. As the daily firebombing raids followed each other and dragged into months, an average of 40 percent of the urban area of the targeted cities was destroyed. These unrelenting and destructive attacks rendered 8.5 million people homeless and, as expected, reduced popular morale dramatically. With railway and shipping across Japan also heavily damaged, the flow of goods in the country was reduced to a trickle, and black markets and bartering flourished as people did what they could to bounce back and rebuild their lives and their hometowns. Much of the pressure to rebuild the future of the nation rested on the shoulders of the youth. It was at this time in history that the modern Coming of Age Day festivities found their origin in the city of Warabi, Saitama Prefecture (Tokyo region). At the end of World War II, with national morale low, the leader of Warabi’s Youth Association held a youth festival on a school lawn in 1946. The objective was to buoy the people’s spirits, particularly the spirits of the youth who had to bear the brunt of rebuilding after a war waged by other generations. 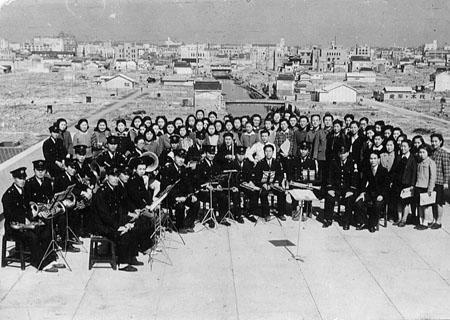 The employees’ chorus of Osaka Gas pose on the roof of the Shinmachi police station with the damaged city in the background. The event was a success and soon, the festivities spread across the nation and ceremonies were held from Hokkaido to Okinawa. With the end of the war and the rapid popularization of coming of age celebrations across the country, 1948 saw Coming of Age Day become an official national holiday, celebrated on January 15th. Since then, Japanese youths turning twenty during the calendar year receive an official invitation from their local government to attend a coming of age ceremony. At the ceremony, 20-year-olds, along with their families and friends, listen to a slew of speeches in an ambiance similar to a graduation ceremony before receiving little gifts. Following the official business, the young adults will pose for photos with family and friends. Given the mostly secular nature of the ceremony itself, some of the new adults will visit a local shrine to partake in shinto blessings. Eventually however most young adults change into informal wear before heading out to celebrate their newly attained legal drinking age at an izakaya. In 1998 and 2001, the Government of Japan introduced changes to the law that shifted some public holidays to Mondays, helping to guarantee more three-day weekends throughout the year. 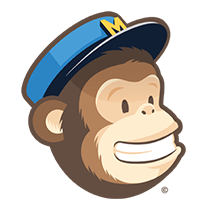 With the introduction of the aptly named Happy Monday System (ハッピーマンデー制度 Happī Mandē Seido), Coming of Age Day now always lands on the second Monday of January. A young lady rocking a furisode kimono. On Coming of Age Day, young men and women don formal attire. While some men continue to wear the traditional hakama trousers to the ceremonies, most now wear western suits. In contrast to the men, women wear spectacular kimono and spend countless hours getting their hair done and their kimonos properly adjusted. Furisode, the most formal of kimonos worn by unmarried women, signifies the transition of young ladies into the adult realm. Literally meaning “swinging sleeves” (振袖) in reference to the long sleeves of the garment, furisode first emerged as children’s clothing for both boys and girls in the mid-1500s. Originally, furisode had shorter sleeves and could be worn as everyday clothes if desired. Over time, as the sleeves grew longer, the garments came to be considered as more elegant and were eventually reserved for formal occasions. The fabric designs of the furisode started to become divided along gender lines in the 1800s, and by the 1900s, this type of kimono became restricted to girls’ and womens’ wear. 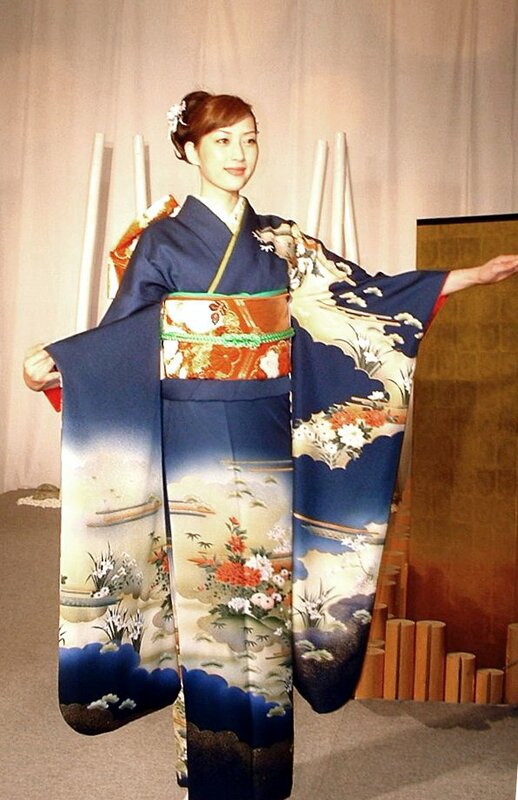 Nowadays, a furisode should only be worn by a woman who is both single and an adult, thereby indicating that she is available for marriage. The more elegant kimonos worn to the ceremonies can cost upwards of one million yen, not including the accessories, personal styling costs, and professional photography work. At these prices, it’s no wonder that many women choose to rent a kimono for an equally memorable day. With Japan’s declining birth rate, attendance rates at Coming of Age Day ceremonies across the country have been dwindling over the past decades. From the peak attendance of 2.76 million adults in 1976, the number has dropped by more than half, to around 1.2 million attendees in the last few years. On top of the birth rate issue, the drop in attendance may also be attributed in part to generations of 20-year-olds that are further than ever from being considered independent adults. With 90% of them still living at home due to exorbitant housing costs, and an economy that has been stuck in limbo for close to thirty years, youth in Japan are often only guaranteed low-paying part-time jobs, making it hard for them to achieve the financial independence that is so closely tied with adulthood. It’s not surprising then that three quarters of Japanese 20-year-olds reported in a survey that they do not feel like adults. With waning interest in actually coming of age has also come decreased dignity at events. Heckling, texting and chatting on phones, and conversations between attendees during speeches have become commonplace. This is cause for consternation among older generations, who often vocally question whether the 20-year-olds being celebrated are actually fit to be called mature adults. In Japan’s culture, where patience and quiet respect of others are highly valued traits, sympathizers of the distracted youth point to the lengthy, dry and boring speeches that are common to such formal events in Japan. In some extreme cases, disruptive behaviour such as setting off fireworks during the national anthem, and driving a car through a police barrier to deliver a keg to the ceremony, have led to violent confrontations, arrests for disturbing the peace, and even the the decision to cancel some annual ceremonies. Coming of Age Day as we know it traces its strongest roots to the festivities held to motivate despondent youth in the wake of World War II. With younger generations now again apathetic towards their own future and that of the nation –now as before because of the very limited possibilities afforded to them– it will be interesting to see how the coming of age ceremonies evolve in future years to meet both the needs of a now youth-strapped nation and the enormous social changes of the past 50 years. What are your thoughts on the topic? Share your comments below or on Facebook. There are so many things that I did not know before reading your posts. Big thanks! Read this if you are curious about coming of age day.